Should you perform your own electrical repairs? We can’t say it enough, in the event that you need electrical repair, the safest option is to ALWAYS hire a licensed electrician to get the job done for you. Although there are many homeowners that are savvy enough to handle minor electrical work, such as installing a ceiling fan or replacing a light switch, DIY electrical work is highly inadvisable. There are approximately 55,000 fires each year as the result of home-based electrical issues, and those fires resulted in over 1,400 injuries and 500 deaths. How do you troubleshoot common repairs safely? If you are either in or near standing water, you shouldn’t operate your electrical equipment. If your electrical equipment happens to come in contact with water, always have a licensed electrician inspect it. Is your home or a part of your home susceptible to flooding? Protect you, your family and your electrical devices by utilizing a ground-fault circuit interrupter outlets(GFCI). You should NEVER attempt to repair any electrical issue if you are not currently licensed or properly trained. Assume that any overhead wires around you are live and therefore fatal to the touch. If one of those wires happens to be damaged during a storm, LEAVE IT ALONE and call a professional right away! When a power surge occurs, the flow of electricity has either been interrupted and then restarted again or something has sent electricity back into your system. There are two kinds of power surges that you should watch out for, internal and external. An internal power surge occurs when one of your electrical devices shuts off and diverts electricity back into the system. External power surges are generally due to lightning, short circuits, power returning after an outage or malfunctions that are caused by the electrical company. Power surges can spell trouble for electrical devices and equipment, and while there is no way to prevent power surges from happening, you can protect your electronics from them. The very best way to ensure that your electronics are safe from power surges is by plugging them into a surge protector (not to be confused with a power strip). 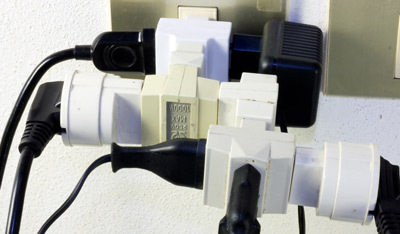 Surge protectors work by ensuring a steady amount of electricity, no matter what. If one of your outlets stops working, your first step should be to check the other outlets in your home to determine if you have tripped the circuit breaker, if your whole house has lost power or if the problem is with the outlet itself. If you have determined the outlet is the problem, inspect it. If it feels warm to the touch or you notice blackening on the face, it may have burned out, and you need to call a professional to replace it. Do you feel like your circuit breaker is constantly tripping? If so, you probably have an overloaded circuit. Overloaded circuits occur when you are putting more demand on a circuit than it can take. For a quick fix, unplug electronics that you aren’t currently using, and pick different outlets when you plug them back in. If the problem persists, it could be a sign of a deeper issue, like loose connections, so don’t hesitate to call in a professional. At ElectricMasters, we offer a wide variety of electrical services, so no matter what kind of electrical repair you need, give us a call. 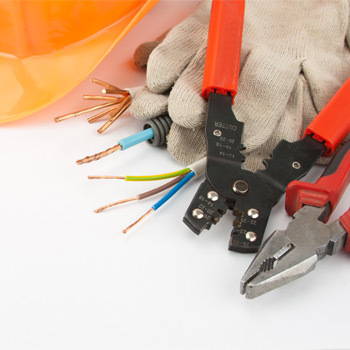 Our electricians are knowledgeable and experienced, and we even offer 24/7 electrical emergency services.